At the end of the Second World War, I was employed by one of my uncles who owned a very large store in North London, retailing Ladies, Gents and Children's clothing which included footwear and a full tailoring service for both sexes. There was also a comprehensive furniture and furnishings department. Once I had decided to venture into business on my own, I set about viewing many different types of retailers ranging from hardware to various forms of outfitting and ranging from London to suburbs and Hertfordshire. Upon these travels I came across Wheathampstead, which reminded me so much of Rye in Sussex and with the sheer beauty of what I saw, I decided there and then that this was the place for me, irrespective of it's business potential. This was in February of 1962 when Wheathampstead was a very countryfied and close knit Society. Being a rank outsider, in fact bordering on an Alien, I was virtually boycotted, with a whispering campaign going around that I would be lucky to survive six months, which almost proved to be well founded. I had other ideas however, so that when it rained, I would pull out the shop blinds, under which, mothers with prams and others would seek shelter. This was my chance, venturing outside to chat with them. I was finally accepted as a reasonable sort of guy and shoppers began to see what I had on offer. To encourage them further, I introduced an extremely good laundry and dry cleaning service. My very small shop at.20 High Street, was destined to become the Manager's Office in Barclays Bank, a fact I had not been made aware of when I purchased the business - so after some two years of trading I found myself shortly to be without premises and nowhere to go. You can imagine my despair. Fortunately, Lady Luck was on my side and I learned that Mr. Bentley who owned the hardware shop at No.36 was willing to sell as he was not happy with the returns he was making. I say Lady Luck was on my side. I again began to feel that she had deserted me as several Mortgage lenders turned down my applications on the appalling condition of the building at No. 36. Finally John Loban the Manager of Barclays put my case to his Head Office and having given them a good account of my satisfactory tenancy at No.20 I was granted the mortgage necessary for me to stay in business in Wheathampstead. Whilst still running my business at No.20, having a few months left of my tenancy, I set about what was to turn out to be a virtual rebuild of No.36. There was so much wood worm and dry rot that all the inside timbers had to be removed, the walls stripped of plaster. The dry rot fungus burned off with a miniature flame thrower, then treated with fluid kindly supplied to me by the then Murphy Chemical Co. with whom I had built up an extremely good relationship obtaining the contract to supply all of their industrial overalls. We had to gain access to the loft area, which had remained sealed since the building was constructed, to ascertain the extent of wood worm infestation in the rafter timbers etc. The complete area was one solid mass of cobwebs and bucket after bucket was removed, crammed tight with webs. We were also somewhat taken aback to see that all the roof timbers used in construction had not even had the bark removed. A complete saturation of all timbers with a Murphy product eradicated that problem. The Reverend Roe was exceedingly kind and generous and gave me permission to burn all the rotted wood in the Churchyard and for weeks on end, the sky was lit up with flickering flames from my large bonfires. In those good old days, Wheathampstead was a thriving little thoroughfare with no parking restrictions. With vehicles parked on both sides of the road, Farmers would on occasion park their vehicles, completely blocking through access to have a little chat with someone. There were no tooting of horns or complaint from other drivers, It was all accepted in good fun and part of the village tradition. What a difference to-day. The road from Wheathampstead to Lemsford and Hatfield was one of the most picturesque and winding lanes I have ever come across, it's charm and splendour soon to be obliterated by our wonderful Planners. The idea of course to sacrifice this for the sake of making the road easier for heavy traffic such as lorries and vans. Needless to say, it wasn1t long, before Wheathampstead was jammed with traffic. Guess what? The Planners solution - Parking restrictions in the High Street, which was inaugurated despite strong opposition from Residents and Shopkeepers. From a thriving little thoroughfare to almost a Ghost Town overnight, and for the second time in my retailing career in Wheathampstead, I very nearly went out of business. To survive, I had to first rent and then purchase a shop in Southdown, Harpenden, working exceedingly hard to maintain a balance between the two shops. I introduced a good alteration and repair service, coupled with dress hire and the patronage slowly increased. I could almost write a book on my life in Wheathampstead as a Shopkeeper, but I feel I might become a bit of a bore so I will close by saying that I retired in 1990 but that I loved every moment of my shop life and have made many friends and gratefully to say, still enjoy their friendship. There are two happenings which I think had much to do with the complete decimation of "Old Wheathampstead" as I knew it. The first was the demolishing of a charming village Fine Fare to be replaced with the very ugly building now being used by several retailers, this, needless to say being the end product of so called Planners. The second sad event was the bulldozing of a lovely old building "Town Farm" despite having a conservation order being placed on it. This was situated at the corner of Marford Road at the bottom of The Hill. I saw a beautiful design of a plan to build a car park on that site with trees and shrubs and seats for people to relax. This would have proved to be a focal point for the village and encouraged visitors who would have seen very clearly the parking facilities offered. Again, this was not to be, the Planners decided against it and the car park was built behind The Bull where few people from outside even knew of it's existence and it did nothing to encourage visitors to the village. Stuart I. Bishop. 12th. January. 2008. 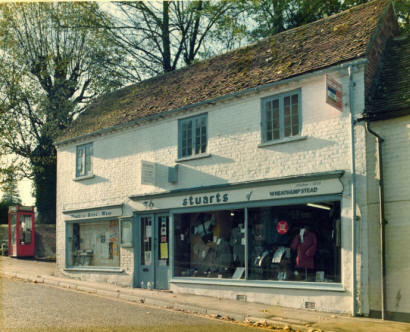 "Stuarts of Wheathampstead", Men's & Boys' Wear Specialists.